The “kids in competition” film has now become its own well-worn genre, so much so that one can be forgiven for cringing at the arrival of a new one. Especially with regards to something like Pressure Cooker, which follows high school students in inner city Philadelphia who are competing for coveted college scholarships by flaunting their prowess… in the kitchen? But don’t judge a documentary by its poster, for while Mark Becker and Jennifer Grausman’s film does build up to a high-stakes competition, it goes to great lengths to establish the outside-the-kitchen, everyday lives of these teenagers who, unlike their middle to upper-middle class competitors, genuinely need these scholarships to continue pursuing their education on a higher level. The odds are stacked up against so many underprivileged children throughout America, but by presenting a situation in which those odds are actually surmounted for once, Becker and Grausman have performed a valuable and inspiring—not to mention breezily entertaining—piece of social service. If it weren’t for Wilma Stephenson, many of these students wouldn’t be in such a fortunate position in the first place. 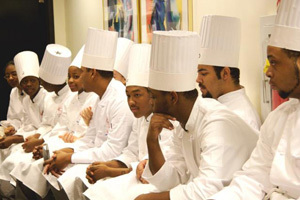 Yet for the first half—and maybe more—of Pressure Cooker, one might not think they’re so “fortunate.” The culinary arts teacher at Frankford High School, and a participant in the nationwide Careers Through Culinary Arts Program (C-CAP), Stephenson lords over her classroom like a bitter Marine Corps Drill Instructor. She yells at them, she yells around them, she barks and barks and barks and cracks loud, grating jokes, yet the kids continue to suffer through it. It isn’t until later that one realizes they aren’t suffering at all. Not only has history proven Stephenson’s phenomenal track record for churning out winners, and not only is she teaching her students a practical skill that they can carry with them into the real world, she is wholeheartedly devoted to them on a personal level. Of course, all high school teachers can’t show this level of commitment—Becker and Grausman don’t delve into Stephenson’s home life but it would be surprising if she has much of a life at all outside of these kids and this classroom/kitchen—yet Pressure Cooker shows the incredibly positive impact that this type of attention and focus can have on a teenager. In this particular year, all thirteen of Stephenson’s students make it to the final round (see? told you she was good). Becker and Grausman choose to focus on three. Tyree is a good-humored, gargantuan defensive end on the football team who has a refreshingly tender and sensitive personality. Erica is desperate to leave the burdens and pressures of her home life behind; she hopes to escape to a far enough away university where she can live her own life. Fatoumata is an African immigrant who has shown a tireless work ethic and a focused determination to take advantage of the opportunities not afforded to her in her homeland; unfortunately, her narrow-minded, controlling father tries to suppress her desires in almost every way. Becker and Grausman patiently reveal the depth and emotional layers of these kids, as they cheerlead, play football, go to prom, and work around the house; so much so that when they enter the kitchen for their last performance, the tension is driven less by the competition itself and more by our desire to see Tyree, Eric, and Fatoumata succeed on a personal level. On the morning of the final competition, the true breadth of Stephenson’s heart fully emerges. Her protectiveness over her children results in her inability to control her nerves, and when she acknowledges how loathsomely she’s seen by the other teachers and students, it becomes damn near heartbreaking. At this point, even the most annoyed viewer has to concede that, brusque as she may be, Wilma Stephenson is an actual American hero. Watching Pressure Cooker, I couldn’t help but think of Caroline Suh’s recent Frontrunners. While many of those students were in a seemingly better situation, both films share a similarly optimistic spirit and tone with regards to our nation’s youth. If only MTV aired films like these instead of the artificially staged “reality” shows that only add to our society’s gross fascination with wealth and celebrity, things might change for the better. For now, it’s at least nice to know that some people are still trying. Don’t let the menu description fool you. Pressure Cooker isn’t just good for you. It tastes good too.